Under seige Wallabies coach Michael Cheika rejected suggestions Saturday that his position is in jeopardy following a 40-12 loss to the All Blacks in Auckland. Australia have now lost six of their past seven games, and Cheika's record is an unremarkable 25 wins from 50 Tests since he took over in 2014. 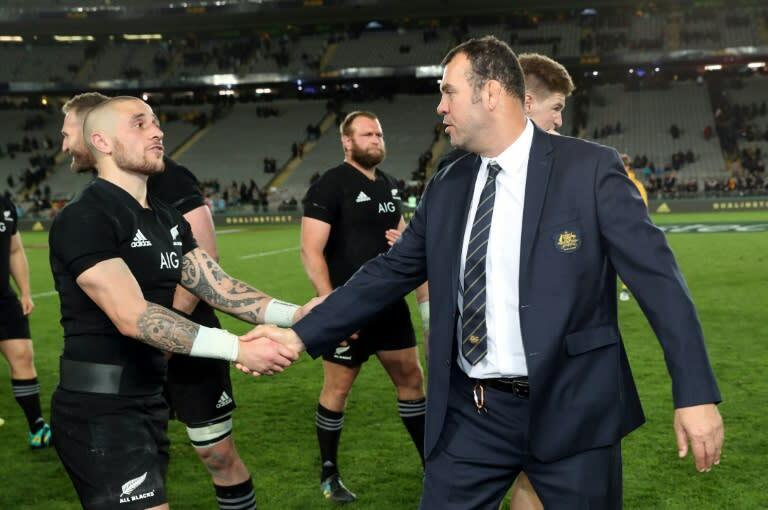 As the All Blacks celebrated winning the Bledisloe Cup in the company of their Prime Minister Jacinda Ardern, Cheika fronted the news media in the next room and angrily dismissed talk that he was under pressure. "If you're naive enough to think I'm worried about my job you don't know me at all," he told one reporter amid media reports that Rugby Australia is growing increasingly concerned about a poor win ratio a year out from the next World Cup. Cheika said Australia's rugby bosses had not discussed his future with him and he was not worried about his position. When pressed if there was a debate in his mind about when was the right time to walk away, Cheika snapped: "You wouldn't know. You've never coached anyone ... if you think there's debate going on in your mind then you need to go and get some pills to sort it out." While the All Blacks delayed taking a shower while their female prime minister was in the room, All Blacks coach Steve Hansen emerged to defend Cheika saying it wasn't the losses that mattered as much as the calibre of teams Australia were playing. "His team, because they lose to us, doesn't become a poor team," Hansen said. "The key thing is he doesn't lose his own convictions and the team don't lose sight of what they're trying to do and listening to them talk it sounds like they've got plenty of belief in who they are and what they're trying to do.